NEW YORK – World Jewish Congress President Ronald S. Lauder spoke Wednesday at a United Nations Educational, Scientific, and Cultural Organization (UNESCO) event held on the sidelines of the UN General Assembly, on the power of education in preventing racism and discrimination, with a focus on antisemitism. The event sought to place political leaders’ support behind the need to develop training programs to address antisemitism in and through education, and build the resilience of youth to violent extremist ideologies, on the basis of guidelines for education policy makers published jointly by UNESCO and the OSCE Office for Democratic Institutions and Human Rights (ODIHR). The WJC has announced its support for this new project, by offering seminars to decision-makers to assist in implementation. The implementation of this initiative is the first part of a UNESCO-WJC partnership, which will continue in November with the launch of a Holocaust education website at the UNESCO headquarters in Paris. Lauder also spoke of the bias pervading the UN, which “singles out one and only one country for condemnation over and over again… the only Jewish state on Earth, Israel. “Between 2012 and 2015, the UN General Assembly adopted 97 resolutions criticizing countries – 83 out of those 97, were against Israel,” Lauder said, adding that in UNESCO alone, between 2009 and 2014, 47 resolutions of condemnation were passed – one against Syria, and 46 against Israel. “Audrey Azoulay, the new head of UNESCO, is making great strides correcting this, and we applaud her for what she’s doing. But after decades of bad behavior at UNESCO, its reputation cannot be cleansed overnight. Especially when this virus of antisemitism still runs throughout the entire body of the United Nations,” Lauder said. UN Secretary General Antonio Guterres told the conference that antisemitism comes under many guises, including calls for the destruction of Israel. “Antisemitism always comes back,” and it is all of our duty to fight back, Guterres said, adding that member states have a primary responsibility to address their citizens’ human rights. The United Nations and UNESCO are doing important work in fighting antisemitism, he said, emphasizing: “I call on all member states to join these crucial efforts." “It is crucial that the entire international community mobilize,” Azoulay added, highlighting that education is the most powerful tool for long-term prevention. Several heads of state, and senior government officials from around the world were also present at the event on Wednesday, with additional statements delivered by the prime minister of Morocco, and ministers representing Argentina, Australia, France, Hungary, Mexico, Morocco, the Netherlands, Spain, Sri Lanka and the United Kingdom. World-renowned historian Prof. Deborah Lipstadt and Mina Abdelmalak, educator at the US Holocaust Memorial Museum’s Initiative on Holocaust Denial and Antisemitism also addressed the audience. 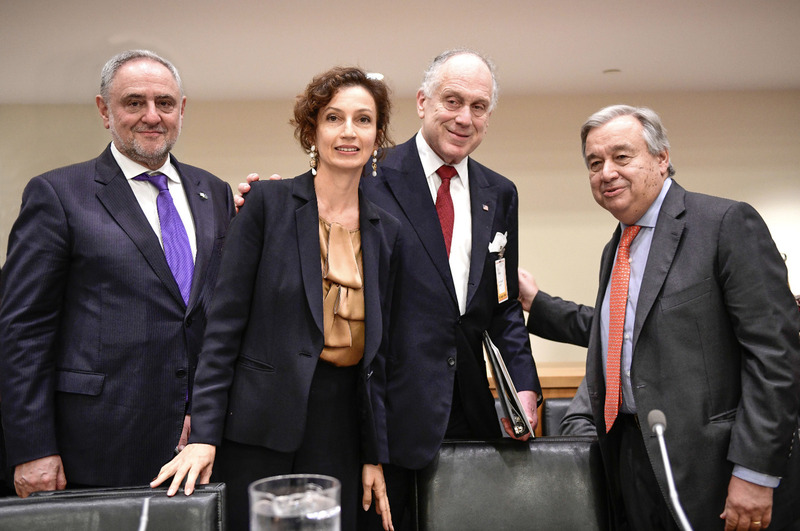 From left: WJC CEO and Executive Vice President Robert Singer, UNESCO Director General Audrey Azoulay, WJC President Ronald S. Lauder, and UN Secretary General Antonion Guterres. (c) Shahar Azran.